This contest is closed. The winners are Tawn, Persephone and Avadonja. Paranormal YA author T.P. Boje is joining us on the blog today to share a guest post on the inspiration behind her Afterlife series and give away three copies of her book, Beyond. Please help me welcome her! Soon she will have to choose between the two worlds. Haven’t we all at some point? I used to do it a lot as a kid. Is heaven for real and what is it going to be like once I get there? What kind of a body will I have? What will I look like? Will all of my family come with me? Will I meet my grandmother there? When I was a child I remember reading Astrid Lindgren’s “The Brothers Lionheart”. To those who don’t know it, it is a book about two brothers that both die and goes to the country Nangijala, a land in “the campfires and storytelling days”. Here the brothers experience great adventures. Together with a resistance group they lead the struggle against the evil Tengil, who rules with the aid of the fearsome fire-breathing dragon Katla. It is really a very beautiful book and I remember how it made me look upon death in a totally different way. Like it could actually be a new adventure. As I grew up I never thought much about life after death and if there really was one or not. I was busy living my life and thinking about my life here on earth. But then one day not many months ago a thought just popped into my head. What if we have to go to school when we die? As it so often happens, the thought wouldn’t go away again once it had come into my head, and I started playing with the idea. If it is true that we leave our bodies here on earth, then we must have some new body on the other side, right? And it would probably take some time to get used to that new body. And how about going through walls and doors and stuff? I mean if we become spirits then we would have to learn how to do all those things, right? And what about flying? That is not something that comes to us easily. We would have to practice first, right? And someone would have to teach us. So eventually I started imagining this school that we all had to graduate from in order to be let into heaven, and soon Meghan popped into my head and started walking around on that school – that just had to be run by angels. She soon made some friends and fell in love (as it often happens when you are sixteen). And that was when the problems began. Because the boy was still human, living on earth, so how could they ever be together? That was when I realized that a book-series was born. And just like the book “The Brothers Lionheart” from my childhood, it was about how dying is only the beginning of the next great adventure. Does the Afterlife series sound like something you would like to try? 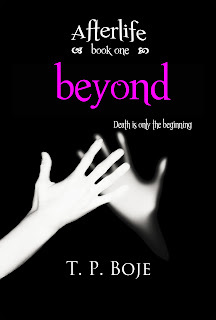 TP is giving away two ebooks and one paperback of Beyond. Just leave a comment to enter. You can learn more about TP and her books by visiting her website. Sounds awesome! I love finding new authors to read! Added to my wishlist! Sounds like a good one to me. Thanks for hosting. Wow, this sounds like a great book! I’ve had those what do you think Heaven is like conversations but other than the Five People You Meet in Heaven, I don’t think I’ve seen a book like this. Sounds great! Great premise, looks like a good read. sounds interesting and I know my younger son who is about Meghan’s age would like this one. It does look very interesting. I would read it and probably recommend it to my niece as well. LOL I am almost 50 and my reading partner is 15. God love her she really likes to read. Sounds good, I like the twist to this afterlife type story! Thanks for the chance! This series sounds very interesting. I would like to read it. I love the premise and I think it’s a very unusual idea- there being a school after death. I don’t think I’ve ever imagined that there’d be such a thing, but being the model student that I’ve always been, I can’t say that it’s such a scary idea:) Thank you for this opportunity! Wow!! Sounds like a great read!! Something new yet to be explored!! Thank yuo for this opportunity! I thought the point of dying in high school was that you didn’t have to go school anymore. I’m kidding…just a little bit. It sounds really interesting though. Thank you for the chance. This sounds like a very interesting read! Thanks for the chance.